Life is pretty good lately! Alex is healthy again, and we are both pretty much on the same sleeping schedule, which means that things are flowing much better! We're still trying to eat only REAL food now and we're doing a great job at it! 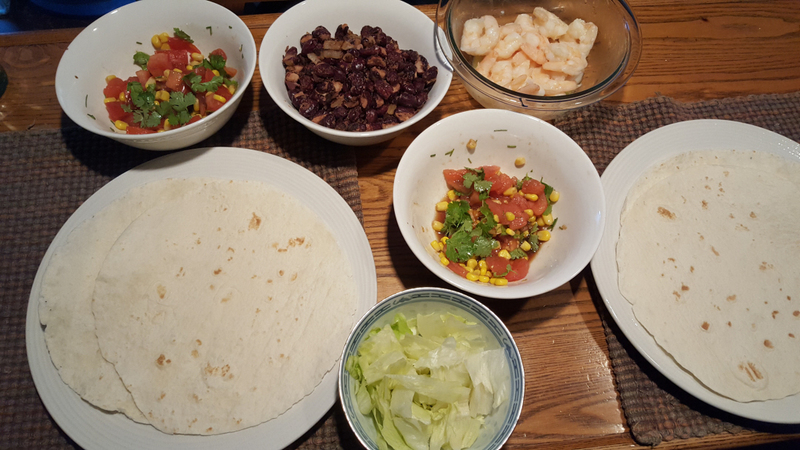 Last night I made shrimp fajitas. Our old style of fajita was made with Old El Paso taco mix, bottled salsa, dollops of sour cream and loads of "cheddar" cheese, which we now call "cheese product" lol...Last night I made a little salsa with tomatoes, corn, our own cilantro and chives and some oil and balsamic vinegar. I started the recipe for refried beans, but we decided not to mash them. It was such a nice fresh meal! I can't wait to pick our own tomatoes and lettuce though! I have to say, I do miss all the melty cheesy stuff...but that's okay, this is yummy too! This was the first morning in over a month that we woke up together! We walked the dogs in the woods, did some chores and had a big brunch. It's my version of an "Egg McMuffin" I guess. 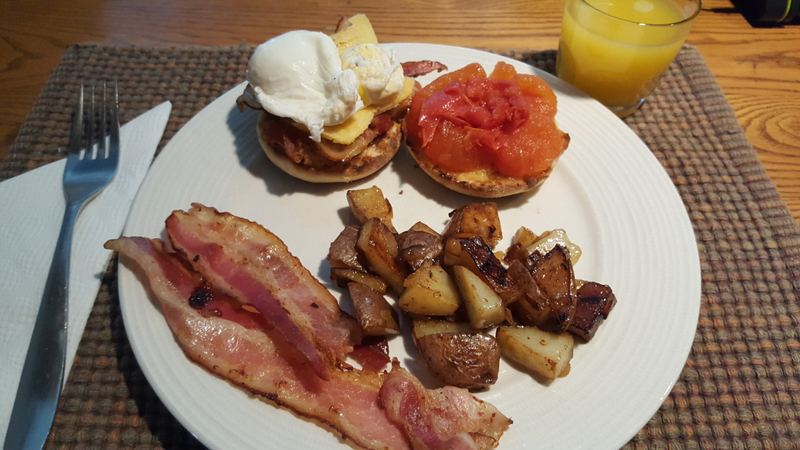 English muffins with bacon, poached egg, roasted tomato and a very tiny bit of Old Amsterdam cheese. I also made my fricassee potatoes (onions and potatoes cooked with some butter for about 30 minutes)...it was so good and very filling. The only non-real food in this photo is the English muffin - anyone have a good easy recipe I can try? hi rain! i always make my own english muffins. just type it in my search bar and you will find it. if you make them, you will never buy them again! they are fantastic! Glad to see things are going well. Love the pizza and the brunch. I do have a recipe and will try to remember between barn cleanings to dig it out and let you have it. It may be a King Arthur recipe so you might want to go to their website and type in English Muffins in the recipe section and see what pops up. Thanks Goatldi :)I found the recipe :) I can't wait to try making my own now. hi rain! i use the recipe to make hot dog buns all the time! I make an English muffin using buttermilk, but there are not many nooks in the muffin. We love it for any meal. There are many out there with sour dough too. We took food to the island, and made egg/sausage sandwiches. Yum. 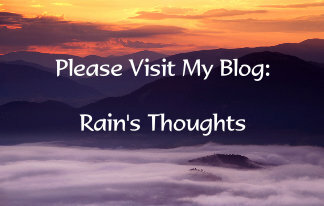 Rain - it's nice that you are both back on similar sleeping schedules - it makes all the difference when it comes to doing things together, meals, companionship. 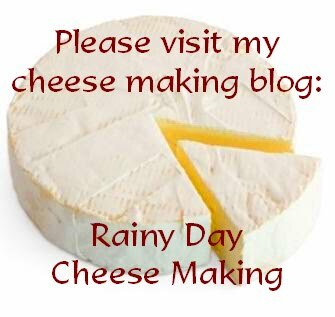 and it's good that you are making good food choices - i miss the gooey cheesy stuff, too, but i allow myself goat's cheeses and just have a little at a time. i also eat parmesan - apparently the more aged cheeses are good for you. the food looks delicious and we would eat both of those meals - deelish! i hope you don't get eaten alive by those awful little black flies - i swear they are my nemesis. and sadly enough i have tried every single home-made bug spray recipe known to man - the ONLY thing that keeps them from biting you is to cover yourself in deet! i know - it's awful but the only other alternative is to wear a bug suit with a bug hat. i can't stand those things - i feel claustrophobic in them! Hi Kristina :) Egg and sausage sounds good on an English Muffin. I love that combo! Hi Kymber :) We're still experimenting with food and Alex had an attack last night so we're kind of back to square one again. It's so hard to figure out the culprit when it's not so obvious. The schedule being similar is really important and we're both so happy things are back to normal again, but we both also know it's a cycle and it'll happen again...so we're rolling with it! DEET is what we use and you're right, it's the only thing that keep them from biting. The deer flies too which are bad in July around here. I hate DEET, but what can you do, like you said once "choose your poison" right? :) I have a bug hat that I must wear though because they love trying to get into my eyeballs those damn things. Gardens are coming along here....now we are getting brutal heat so things are growing nicely. I water just about every evening to make sure nothing gets dried out. My potatoes in their bags are coming along like gangbusters. I need to get some more compost and soil which I will do tomorrow. I hope the "real" eating does well for Alex and that you can carry on with a good balance of proper food. I hope the sun continues to shine for you and that no bugs find you. Its only a matter of time before the mosquitoes come out here full force. That's when I go inside. Hi Dianna :)) I'm jealous of your brutal heat!!! It's 12 degrees and rainy right now. Ugh! But all is not lost, I know summer is on its way, just a little slow this year! Congrats on your potatoes growing! I can't wait to see some sprouts!!! The food we're eating is so good, but I do miss my cheesy stuff. :) Can't help it! I'm trying to get to Real Food eventually....but I hate to waste so as soon as I am done with things then no more. I ate fairly healthy but I can do better! You are so amazing with your wonderful garden and I still can't get over the chicken wire! I might be able to garden here now too! Thank you! Oh I am so happy for you dear Rain that finally Alex is feeling better and You both are enjoying you healthier food and lifestyle again .food is most important to stay healthy so please make careful choices always. Glad you both took good walk in woods together and had great time my friend! Thanks Baili! And I hope you're healing more each day as well! Our digestion is so good now, it's hard to give things up that you love, but sometimes you just have to right?